The Dovre 500 stove is available as a wood or multi fuel version. The wood burning Dovre 500 CBW can be used for burning wood in smokeless zones . This stove has one door and the glass has a curve on the top edge. The glass for the Dovre 500 is available as a clear or lattice design. The multi fuel model comes with either a fixed grate or a riddling grate. 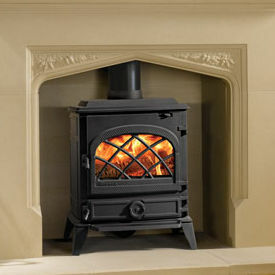 Stove expert replied: A great review and a stove that has fulfilled the customers needs and more. Stove expert replied: I would not recommend slumber burning, especially if you live in a smoke control area. It creates much more smoke which is what the smoke control area designation is attempting to avoid. Other than that it is great that you have had such a great experience with your stove.